Taste test: These are good barbecue chips with a lot of barbecue flavoing. The taste is kind of a mixture of sweet and spicy at first, but then there's a hot aftertaste that has a bit of a kick to it and lingers for a little while. Smell test: A good sweet barbecue smell. From the package: “Got a taste for more? 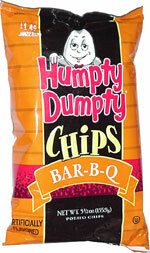 With Humpty Dumpty, there's more for you.” ... Ingredients include Onion Powder, Paprika, Garlic Powder and Molasses.